Sandgrouse live in some of the most parched environments on earth. 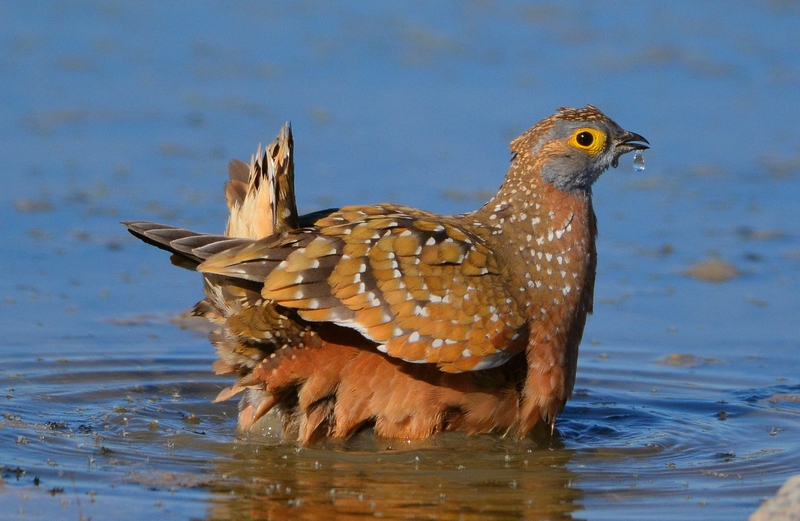 To satisfy the thirst of their chicks, male sandgrouse carry water back to the nest in a surprising but effective way: by carrying it in their feathers. Thanks to coiled hairlike extensions on the feathers of the underparts, a sandgrouse such as this Burchell's Sandgrouse can soak up and transport about two tablespoons of liquid. The sandgrouse chicks use their bills like tiny squeegees, “milking” their father’s belly feathers for the water they need. Sandgrouse — pointy-tailed relatives of pigeons — live in some of the most parched environments on earth. To satisfy the thirst of newly hatched chicks, male sandgrouse bring water back to the nest by carrying it in their feathers. It sounds incredible, and for decades, scientists thought it was just a myth. But it’s not. In the cool of the desert morning, the male flies up to twenty miles to a shallow water hole, then wades in up to his belly. The water is collected by “rocking.” The bird shifts its body side to side and repeatedly shakes the belly feathers in the water; fill-up can take as long as fifteen minutes. Thanks to coiled hairlike extensions on the feathers of the underparts, a sandgrouse can soak up and transport 25 milliliters of liquid. That’s close to two tablespoons. Once the male has flown back across the desert with his life-giving cargo, the sandgrouse chicks crowd around him and use their bills like tiny squeegees, “milking” their father’s belly feathers for water they so desperately need. Bird sounds provided by The Macaulay Library of Natural Sounds at the Cornell Lab of Ornithology, Ithaca, New York. Chestnut-bellied Sandgrouse  by Myles E.W North; Lichtenstein’s Sandgrouse  by Myles E.W. North. Check out this blog with photos and videos of sandgrouse!